Welcome back! 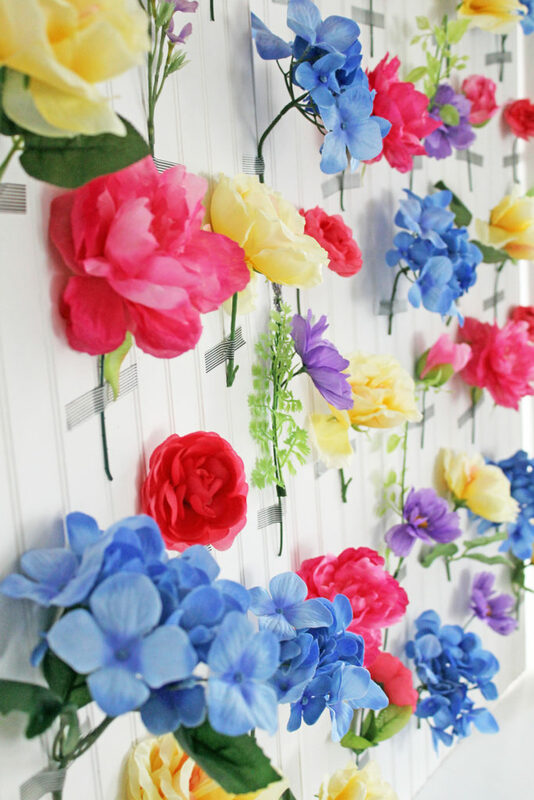 If you read YESTERDAY’S POST, you know all about the floral wall I created using silk flowers and washi tape. 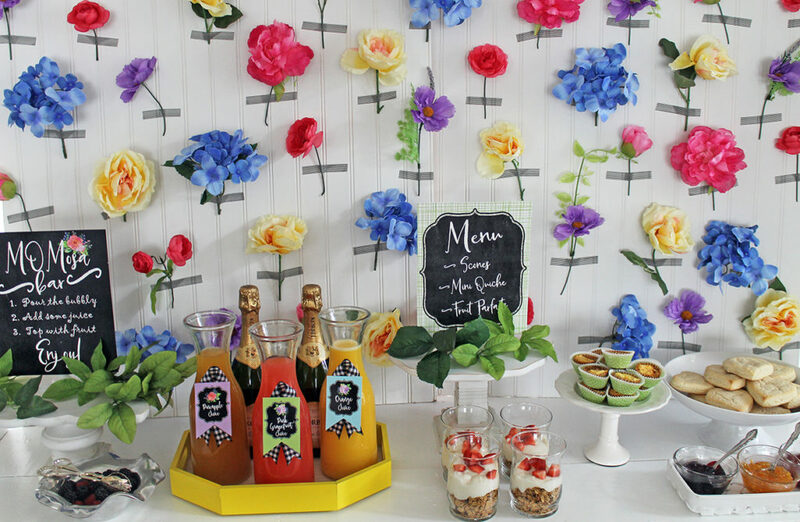 I just love washi tape, and I had a great time using it to create the floral backdrop for this event styling. The inspiration for this event really came from THESE PLATES. I just thought they were so lovely and beautiful! 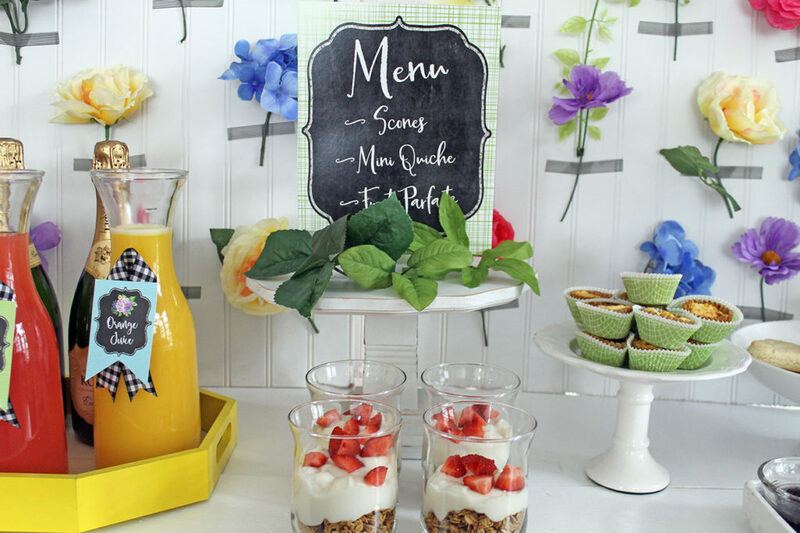 I wanted to incorporate the bright colors and spring blooms throughout this brunch. 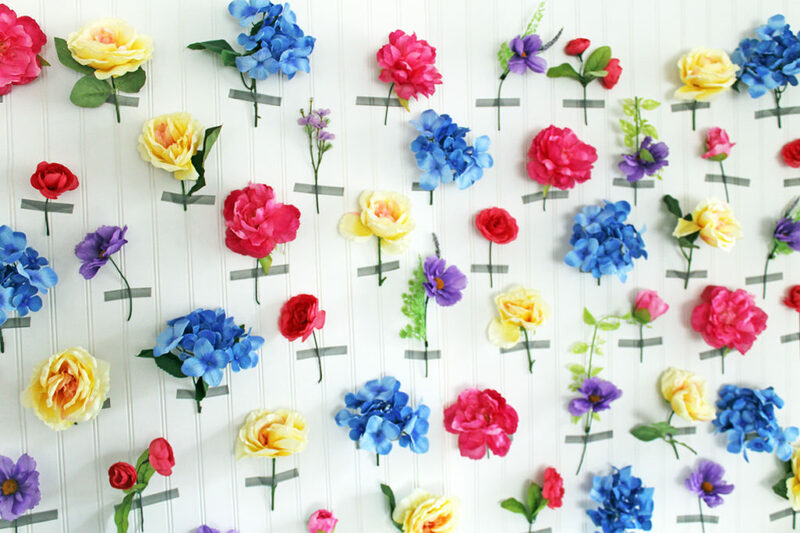 Thus, the floral “wall” became the backdrop. 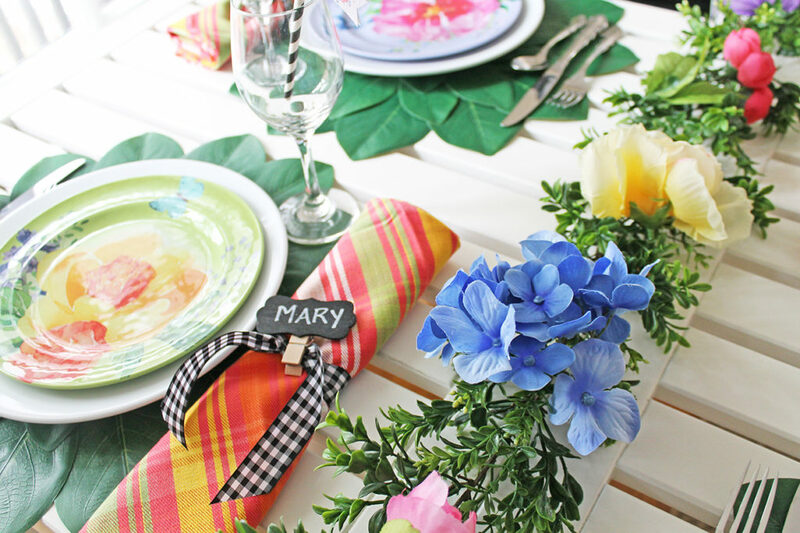 First, let’s talk more about those plates and the table setting I created using them. 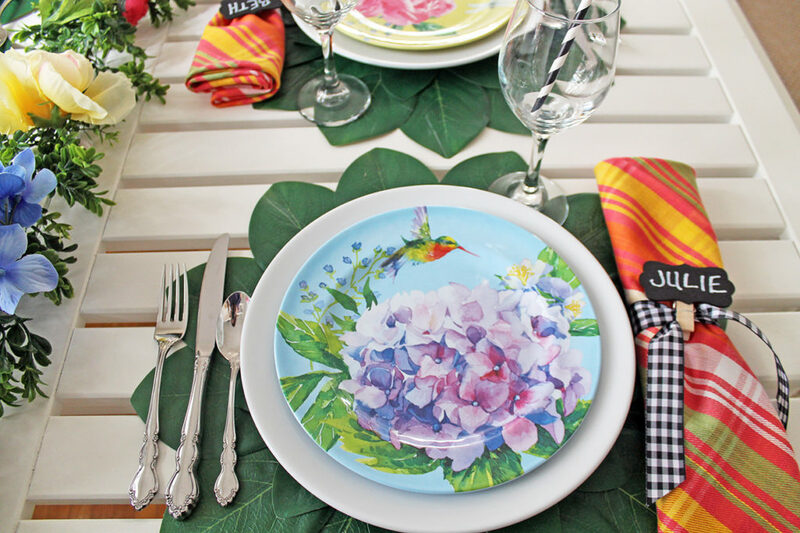 They come in a set of four, with each plate having a different floral design on them. This allowed me to use a lot of color on the table. 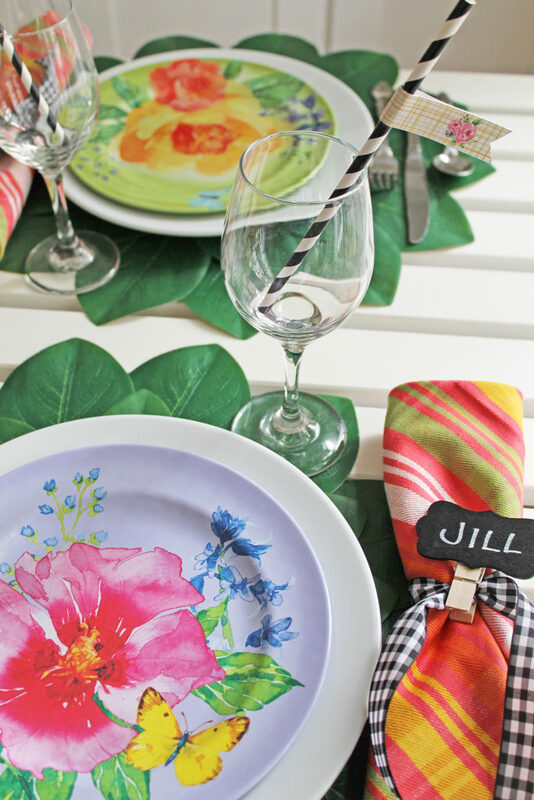 THESE GREEN LEAF PLACEMATS were the perfect base for the place settings. 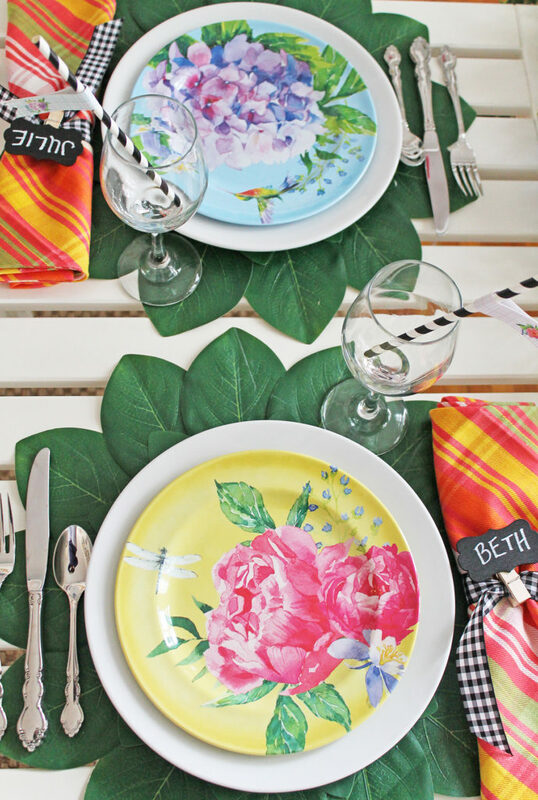 I layered the plates with larger white dinner plates under the floral plates. 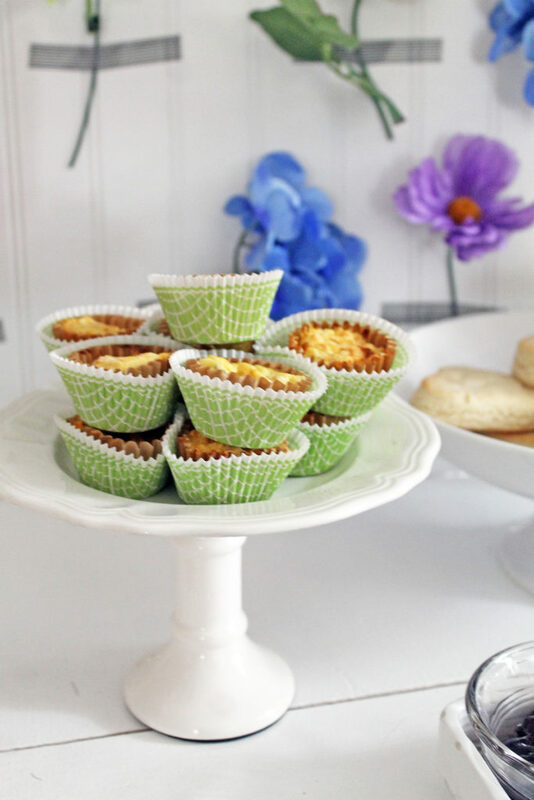 For another pop of color, I chose THESE CITRUS CHECKED NAPKINS for the table. 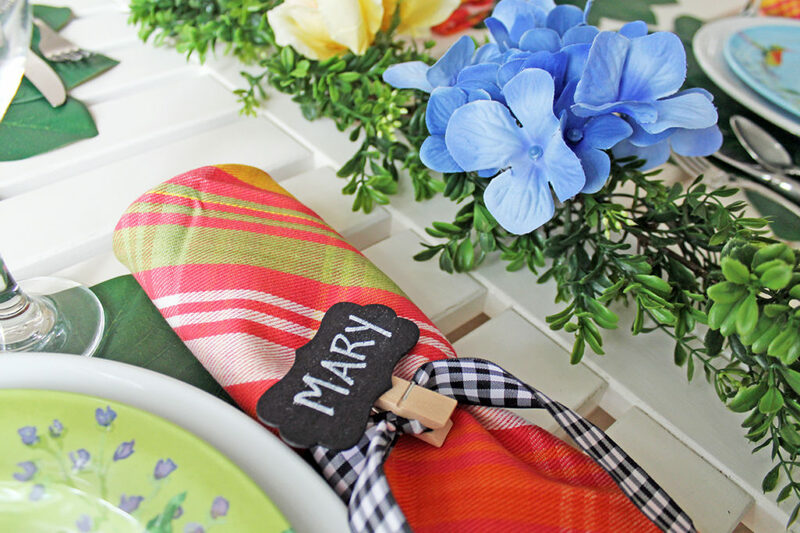 With all this color, I added some small touches of black to the table, by tying some black gingham ribbon around the napkins. 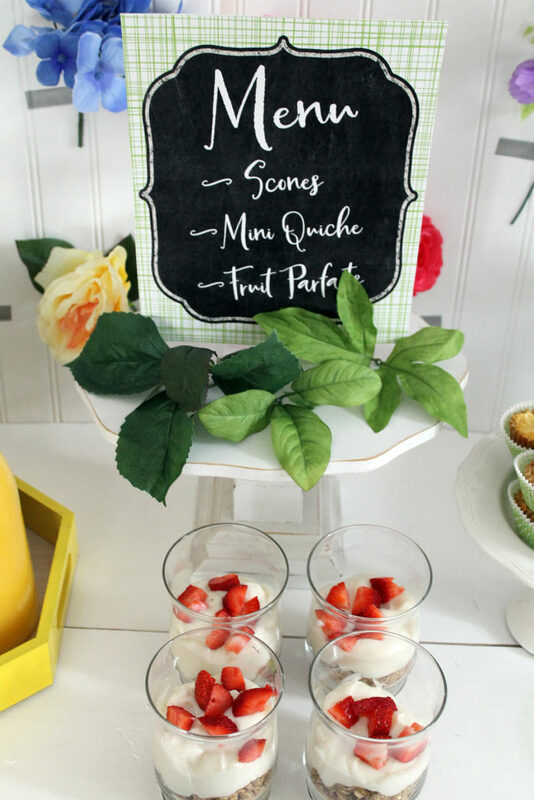 The chalkboard clips served as placecards and were attached to each napkin, marking each guest’s place at the table. Another touch of black was the striped paper straws placed in each glass…perfect for sipping a MOMosa! 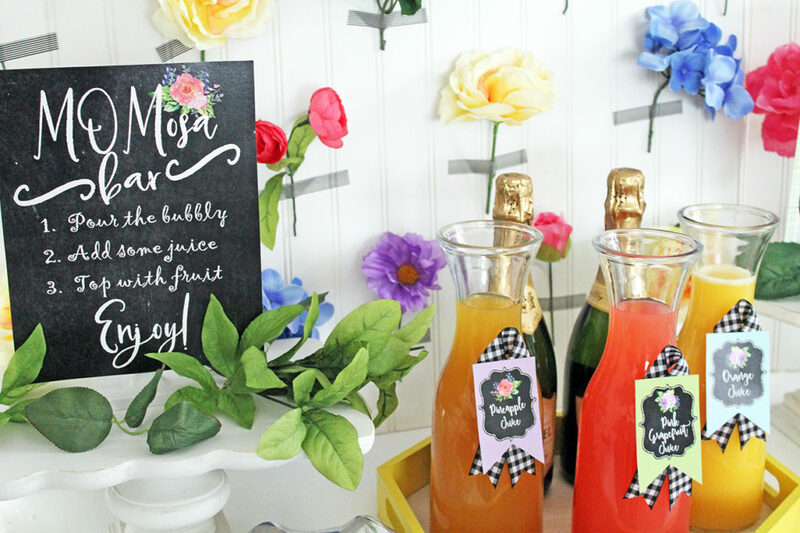 Now because it is a MOMosa brunch, we needed some bubbly! 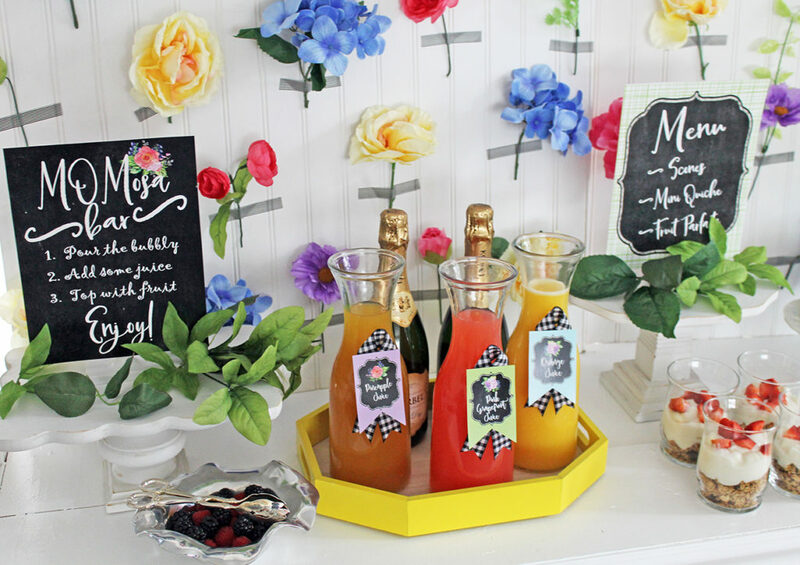 Champagne is a must for celebrating moms, right? 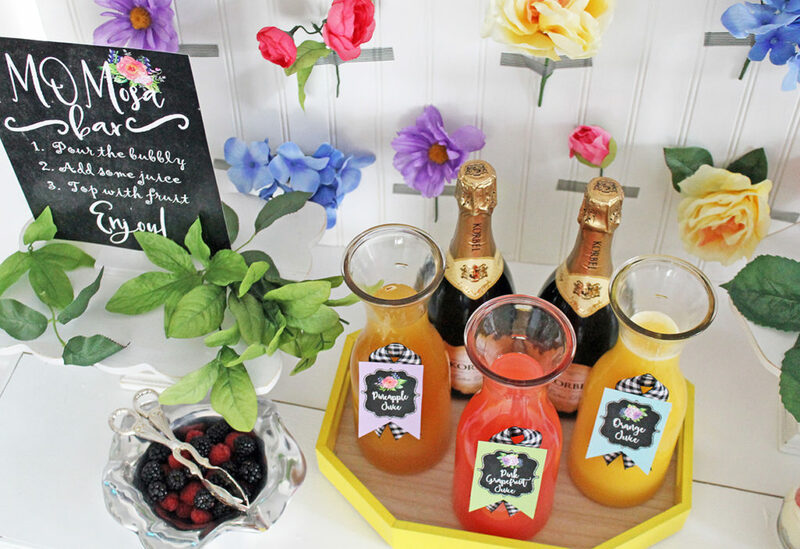 Along with the champagne, there were a few juice choices…orange, pineapple, and red grapefruit. 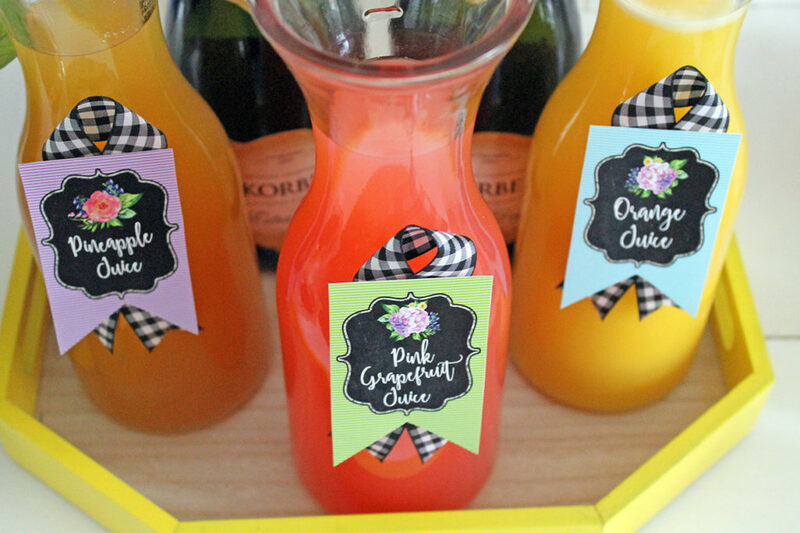 I worked with my friend, Christina, at Sunshine Tulip Design to create some fun, coordinating printables for this brunch…including the juice labels, which I attached to the carafes with the same black gingham ribbon that I tied around the napkins. 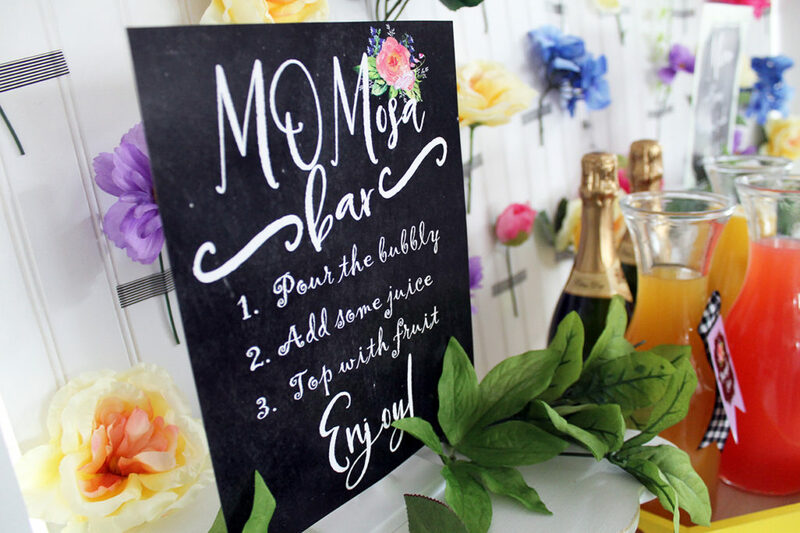 The “MOMosa bar” sign was perfect…a black chalkboard-inspired background, with bright florals that instructed the guests to create their own MOMosa. And did you notice the coordinating paper flags on the straws? 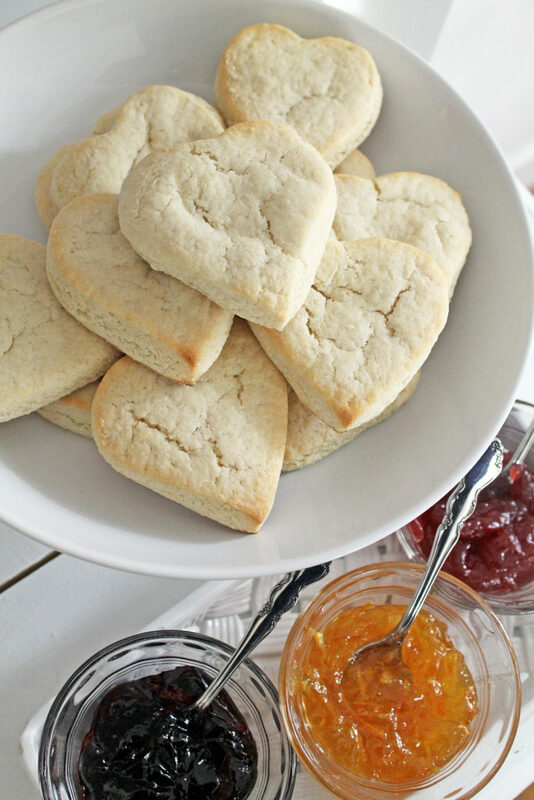 She created those, as well…all these beautiful printables are available in HER SHOP. 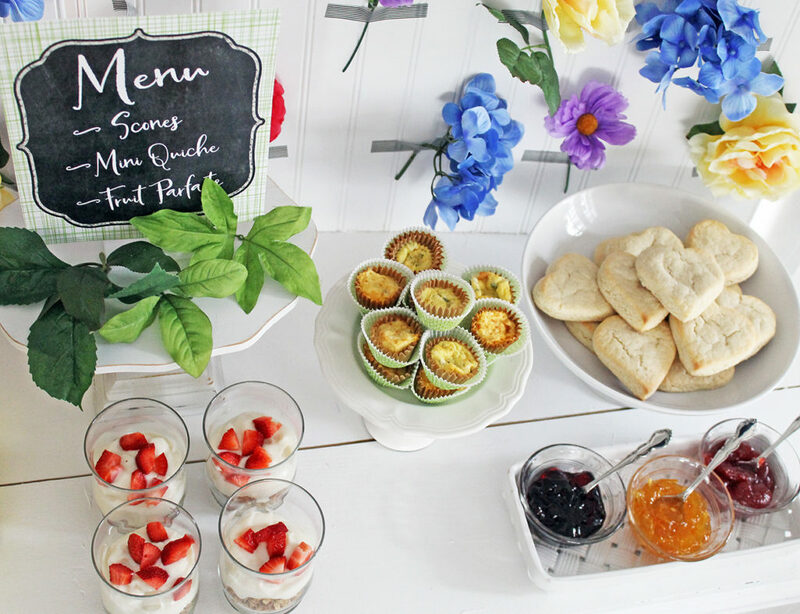 The menu consisted of heart-shaped scones (served with grape jelly, orange marmalade, and strawberry jam), mini egg quiche, and fruit & yogurt parfaits…tried and true brunch food! 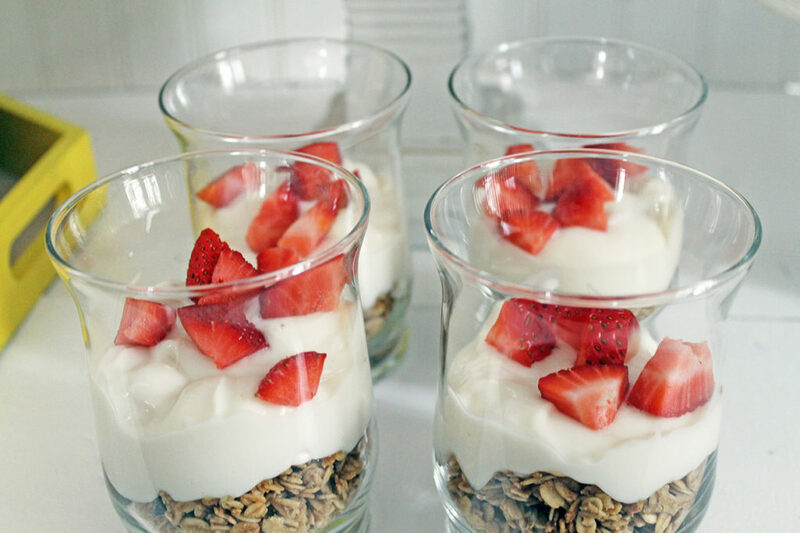 Small individual servings made it easy for guests to serve themselves. I hope you were able to find a little inspiration for your upcoming Mother’s Day celebrations…toasting those special moms with a MOMosa is a good start to any celebration!